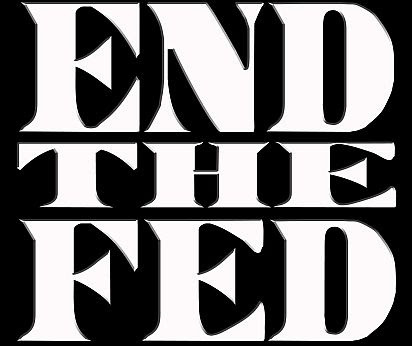 by colonelnogov • February 29, 2016 • Comments Off on End The Fed! Odds are, you’ve heard it dozens or maybe even hundreds of times if you spend any time around political Libertarians. It is very true that The Fed is intimately tied with most of what is wrong with the country. It’s a private company… but has ‘special privileges’ beyond what even corporations that own many politicians have… in their monopoly on the ‘right’ to create money from nothing and charge interest on it. The member banks all benefit from this monopoly… and they control most of the financial activity in the nation. It is secretive, often cryptic in it’s comments and fiercely fights to block the audits that Ron and Rand Paul continually call for. There is no doubt that violently enforced monopolies are bad for everyone… except the monopoly holder. Having a monopoly on the ‘right’ to issue fiat currency… is a guarantee that the currency will eventually fail… as the monopoly eliminates competition that would force the issuer to maintain the value of it’s currency. The Fed even has a stated policy of decreasing the value of the currency by 2% per year. If everyone could choose between a stable currency… or one that lost 2% every year… would anyone use the latter? Worse than that… ‘price fixing’ the cost of capital fundamentally damages markets by blocking honest ‘price discovery’ meaning that price, which should be a ‘market moving signal’ is now worse than ‘not correct’… it’s wrong. It would be better to go nowhere than to go in the wrong direction… but The Fed attempts to take a short cut to economic growth by falsifying the signal. In a free market, the price of money (the interest rate) would be an indicator of the amount of savings relative to demand for capital. An increase in savings with no corresponding increase in demand for capital would push interest rates lower. That is the correct signal that there is deferred demand and capital expansion is in line with meeting that future demand. The Fed, by forcing rates lower in an attempt to fool business into expanding where there is no real deferred demand, creates malinvestment that eventually leads to excess capacity and unsold inventories. Excess inventories continue to grow until it’s clear that demand will not improve. Then, inventories are liquidated, production is reduced, layoffs are made, loans are defaulted on and eventually bankruptcies happen. After decades of gradually lowering interest rates… we’ve had seven years of zero percent interest rates… and it didn’t work. In these past seven years, we’ve also seen QE fail to impact ‘main street’ while massively increasing housing, stock and bond prices… which is good for the wealthiest 10%… disastrous for the rest of us. So, there is nothing positive about The Fed… everything it does is criminal and ideologically wrong. However, when talking with political Libertarians about what they expect to change if The Fed were ended… I’ve never got a single reasonable response. Do you think The State would end it’s monopoly on currency? Do you think The State would end it’s manipulation of interest rates? Do you think The State would end it’s attempts to manipulate markets with QE? Seems to me that it’s not remotely reasonable to answer yes to any of the above. The Fed… is just a symptom of the real problem… The State. It is fundamentally an issue of violently enforced monopolies… which can only exist because of the violence of The State. End The Fed… fixes nothing. End The State… fixes… everything (exaggeration… but not by much).